What bride doesn't need a little help writing their wedding invitation wording? There are so many rules and etiquettes to follow! Writing the wording for wedding invitations can get tricky! And we all want to give it that personal touch - that little spark that makes it "you". Below are some samples verses and wordings to help you get started on the right path. You can mix and match, add your own personal touch and sentiment, or even drop us an email to add your own ideas to this page! We'd love to hear from you and our readers would certainly appreciate a bit of advice or unique wording ideas! Writing wording for wedding invitations can indeed be almost as hard as writing your own vows. Here is a collection of verses to help inspire you. Feel free to use them word for word or mix and match a few lines to come up with the verses that are perfect for your wedding, and your wedding only. request the honour of your presence. and promise our love to each other. 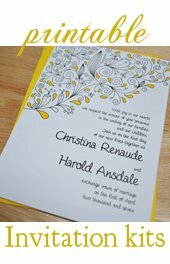 Do you have some unique wedding invitation wording ideas or invitation etiquette advice? 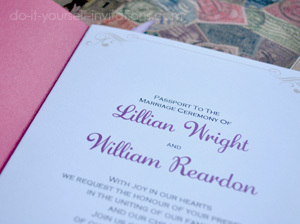 Need help with some wedding invitation wordings or invitation etiquette situations? Or maybe We'd love it if you'd share with our readers! Fill in the forms below and we'll add your ideas and suggestions to our page.Have a question? We'll try and answer it and even give our readers a chance to answer it as well!